We're back home, safe and sound, and the house is in one piece. It seems that the Evilpixie has taken her responsibilities very seriously in our absence and has taken good care of both Bubba and the house. We are relieved and very pleased. I have a major book update to do as I've not mentioned any of the books I read while on holiday so that will follow later today hopefully. Meantime I am suffering with jetlag which always affects me more when I come home so it will be a quiet day today, though I must get some shopping in - the cupboards look like a horde of locusts swept through while we were away. Luckily I'm not back at work until Wednesday so there is a chance that my brain will be back in service by then - currently it is a bit on the woolly side. In politics we find ourselves plunged straight from the razzamatazz and excitement of the US Elections into the unremitting beige-ness of the Labour Party Conference. Yawn. Welcome home, Pat. 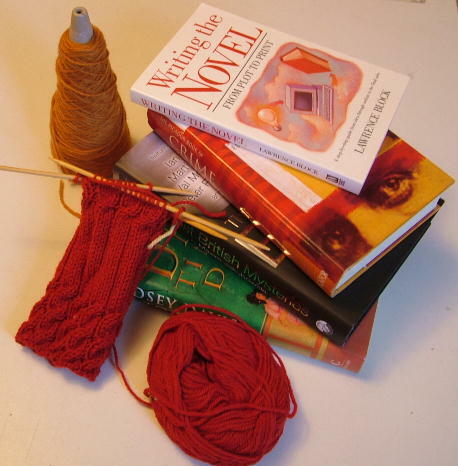 I've really enjoyed reading your posts while you were away (so has Karen), sounds like a great holiday that tapped perfectly into your knitting and reading interests. Thanks also for the Ian Rankin, I must return the favour with one of my books - I did a massive Oxfam book shop donation a couple of weeks ago but will keep you posted with any new titles that come my way.....Looking forward to reading the reviews of your holiday books.